Chicken Corner is the name of a place that does and does not exist, which puts it right in league with a web site that’s all about a neighborhood. 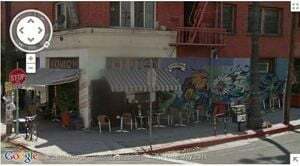 Technically, Chicken Corner sits at Echo Park Avenue and Delta Street, across from the Magic Gas gas station and Morton Avenue. For generations, this crossroads has been one of the nerve centers of the neighborhood. It has been a gang hangout, a drug market, an art gallery scene and now a fashion/indie rock scene, as well as a place where a lot of families have lived. Not everyone in the area knows or accepts the name Chicken Corner. It’s not clear what’s going to happen to Chicken Corner but it remains archived on the L.A. Observed site.